In 1993, father and son Steve and Roddy Powley were charged with hunting a moose without a license near Sault Ste. Marie, Ont. The Metis Nation Ontario (MNO) went into considerable financial debt to support the Powleys’ fight to the Supreme Court of Canada, which upheld the ruling of the lower court giving Metis peoples rights under Sect. 35 of Canada’s Constitution for the first time ever. The official Metis Nation homeland map, however, does not include the Powleys’ home community of Sault Ste. Marie. The map, approved last month at the Metis National Council general assembly, outlines a homeland stretching from northeastern British Columbia into a portion of the Northwest Territories and then east across the Prairie provinces in their entirety to a small section of western Ontario and areas of some northern states in the U.S.
Also at the general assembly, held Nov. 28 and Nov. 29, the MNO was placed on probation for one year for breaching citizenship requirements, unilaterally accepting six historic Metis communities and members that did not adhere to the citizenship criteria adopted at a MNC general assembly in 2002. The whole situation – the exclusion of the Powleys’ community of Sault Ste. Marie from the Metis Nation homeland map, MNO’s probationary status, and having no input into the report “Addressing the Integrity of the Historic Metis Nation Homeland,” which condemned MNO’s actions – has MNO President Margaret Froh angry. “We fought hard and we did it for all the right reasons and we were successful in securing the Powley decision which was a total game changer in the history of Metis people in Canada. A total game changer,” said Froh. “And to then be told that very community is not part of the historical Metis Nation homeland and to have the MNO placed on probation.” Froh hails from Saskatchewan and now resides in the Georgian Bay Historic Metis Community. 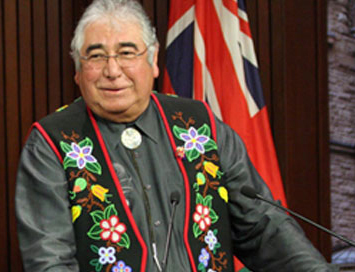 Tony Belcourt, founding president of the MNO, is astounded by the MNC’s decision not to include Sault Ste. Marie as part of the homeland. “They want it both ways. They rely on the Powley decision for negotiations and for legal reference, but they do not rely on Powley for determining who can belong to the Metis National Council... You’ve got to come from the west or that little territory in Ontario and that’s it. If you don’t, you don’t belong,” said Belcourt, whose historical Metis roots are in Alberta. The Supreme Court of Canada established a 10-point Powley test for determining the legal definition of Metis. However, MNC, and other Metis provincial organizations, say that Metis people, not the courts, determine who are Metis citizens. And according to the MNC’s definition of Metis, the Powleys do not meet the criteria for citizenship in the MNC. The Powley decision (2003) is referred to by legal counsel Jason Madden, co-managing partner of Pape Salter Teillet LLP, which represents MNO, as part of “the trifecta of Metis case law” that has moved Metis rights forward. That trifecta also includes the Manitoba Metis Federation decision (2013) that says Metis have outstanding land claim and the Daniels decision (2016) that gives the federal government jurisdiction for Metis people. “These three cases put together create the foundation for moving forward with this recognition around self-government within each of our responsible jurisdictions, advancing Metis rights,” said Froh. However, moving forward has become more complicated, she admits, as the federal government may need to expand its reach. “This is the challenge that has now been created with the decision that the assembly has made,” said Froh. According to the MNC, Metis are persons of historic Metis Nation ancestry, which, as of late last month, is now defined by a specific Metis homeland map. The MNC and MNO intersect on only one historic Metis community and that is the descendants of the Halfbreeds of Rainy River and Rainy Lake who collectively adhered to Treaty No. 3 in 1875. However, the MNO and the Ontario government have identified six other historic Metis communities and those people hold citizenship in the MNO, but are not part of the national registry. To get full re-admittance to the MNC, the MNO must, in part, rescind its declaration of the six historic Metis communities and have its citizenship criteria align with MNC. Froh says the next step for the MNO executive is to meet with its leadership and citizens to determine the path forward. One option is to look at the political relationship that can be formed with the MNC and the rights bearing Metis communities in Ontario that now fall outside the Metis homeland. Another path forward could be for the MNO to strike out on its own. While the federal government has signed an accord with the MNC, it is also part of a trilateral agreement with the MNO and Ontario government. “What is very clear from Canadian laws is that there is no hierarchy of Metis rights. Metis rights have to be reflected and recognized whether they fall in or outside what has now … been defined as the historic boundaries of the Metis Nation homeland,” said Froh. Belcourt goes a step further. “The government of Canada will not sign an agreement with one organization knowing full well that a whole bunch of people are not included in that agreement. So, if (MNC) kicks the MNO out, all it means, as far as I’m concerned, is that the government of Canada will be obliged to enter into an agreement with the Metis National Council and a separate agreement with the Metis Nation of Ontario. There’s just no other way,” he said. While Froh is frustrated with how things have transpired, she holds to two truths. The first is that the Metis government is stronger when it stands together.